One of the fastest growing towns in Florida, Fort Myers is situated at the western coast of the Sunshine State. A very popular tourist destination for the state, Fort Myers is home to an array of unique attractions and monuments like the winter estates of Thomas Edison and Henry Ford. Like most of the rest of Florida, Fort Myers enjoys very hot weather all year long and is a popular location for many kinds of outdoor activities, including kayaking. To have the best possible time while kayaking in Fort Myers, you’ll definitely want to get in touch with one or more of the city’s many great kayaking companies. Offering guided kayaking tours, rentals, outfitting services, and more, these kayaking companies can give you all the equipment and guidance you require to make magical memories on the waters of this beautiful Florida destination. Established way back in 1999, Kayak Excursions is one of the most professional and well-respected kayak and stand up paddleboard companies in Fort Myers, Florida. Offering kayak tours, rentals, and even kayak fishing expeditions, there's nothing this company doesn't provide when it comes to kayaks. Tours are available for people of all ages and especially popular with young kayakers as everyone will get a great chance of seeing dolphins and other exciting wildlife along the way. Tours run from the company's Bunche Beach location and can be customized to suit your needs, taking in different locations and lasting different lengths of time, depending on what you and your group want to do. This humorously named kayaking company runs a whole range of guided kayaking tours in the Fort Myers area, as well as serving Bonita Springs, Cape Coral, and other beautiful kayaking locations right nearby. Whether you're looking to paddle up close and personal with manatees and dolphins or explore the coastline with a friendly, educated guide leading the way, this is a great company to choose. Crazy Woman Kayaks runs some of the best kayaking tours, including the option to organize individual tours and kayak lessons too. Kids and families are fully welcome, along with family dogs if you'd like to bring them along too. Offering a very friendly welcome and an authentic experience very time, Crazy Woman Kayaks is a kayak company you’ll simply fall in love with. 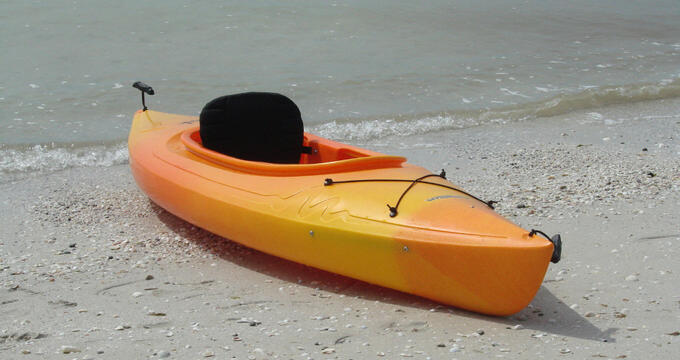 As well as being a fishing charter company, Good Time Charters also runs kayaking eco tours around Fort Myers Beach. Single and tandem kayaks are available for these tours, with each one being led by fully certified and highly entertaining guides who can answer any questions you might have along the way. The guides will also offer fascinating insight and history lessons regarding Fort Myers and its native flora and fauna, helping you learn more about the area as you paddle. Spot dolphins, rays, turtles, and more among the mangroves of Estero Bay and the surrounding Fort Myers waterways on these low price, high value kayaking tours. Spend time with your loved ones at the appropriately named Lover's Key, right nearby the beautiful city of Fort Myers. Lover's Key Adventures offers both kayaking tours and rentals along the coastline of this picturesque island and state park. One of the most visited beaches and state parks in all of Florida, the beauty of Lover's Key simply cannot be understated and there's no better way to take it all in than by kayak. Manatees and dolphins can be seen swimming right alongside tour groups in this area, with tarpon and other exciting fish species being easily spotted as well. Sunset and full moon kayaking tours are available, as well as estuary and Mound Key tours too.